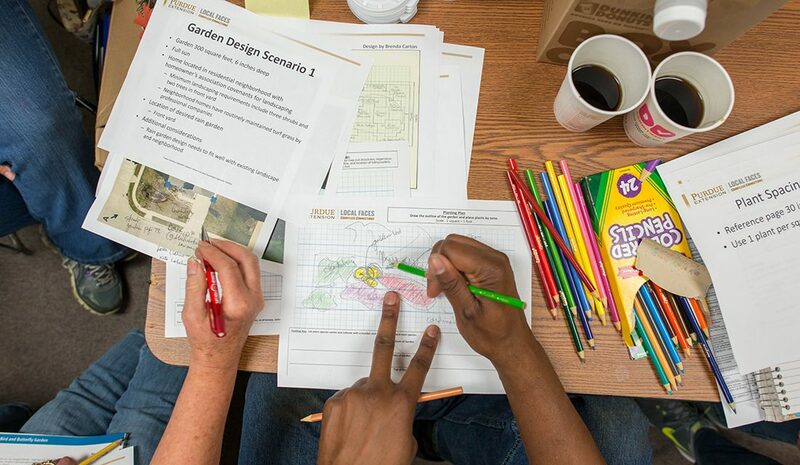 Participants create sample rain garden designs at the workshop. As a new intern with Illinois Water Resources Center, I attended a workshop last month with about 30 people from organizations including Peoria Public Works Department, Peoria Innovation Team, and Illinois Master Gardener and Master Naturalists at the Peoria Public Works building to learn the fundamentals of rain garden design. 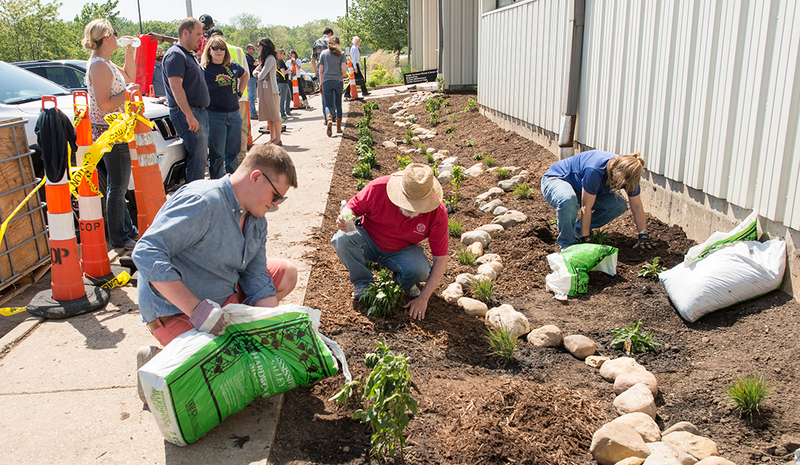 Peoria’s interest in installing rain gardens has grown out of a pressing need to manage stormwater to help mitigate overflows from the city’s combined sewers into the Illinois River. Rain gardens can be part of an overall green infrastructure strategy that significantly reduces combined sewer overflows. IISG and the city of Peoria worked together over a year to finalize the details on this workshop, an important step towards addressing the the stormwater issue. After an early-morning drive from Champaign to Peoria, I had the opportunity to listen to several guest speakers, including Kris Lucius, a landscape architect with SmithGroupJJR, and Eliana Brown, IISG stormwater specialist who introduced the group to rain garden design essentials. We also heard from Jason Haupt, Illinois Extension educator, who discussed details regarding plant species and best management practices for maintaining rain gardens. Following a brief lunch, Kara Salazar, sustainable communities extension specialist, led the attendees on a group rain garden design scenario activity. Each group was tasked with a specific rain garden scenario that presented different planning obstacles. Jason Haupt, Illinois Extension educator, speaks during the classroom session at the Peoria rain garden workshop. My group was responsible for developing a rain garden in a typical suburban home setting. The role and functions of landscape architecture, which I’ve learned from my graduate studies as well as this workshop, can encompass numerous realms, including urban planning and design, architecture, and economic and community re-development. Tuesday’s events brought many of these fields together. Designing and planting the rain gardens served as both a conceptual and physical implementation of green infrastructure and development. How this small project will serve as a precedent for the City of Peoria is one of many aspects of landscape architecture that interests me. Cameron Letterly, left, helps distribute mulch at the rain garden build in front of the Peoria Public Works Department. Darren Graves, intern at the Public Works Department in Peoria, designed the project that the participants then planted in front of the building. “I think landscape should be more than just shrubbery,” Graves added. All the participants gather for a photo in the new rain garden. I initially had no idea of the scale, nor incredible enthusiasm of the volunteers for this project. However, after consulting the master plan and after digging the numerous holes for plants, I knew this experience was a step towards greater green infrastructure awareness for all involved. 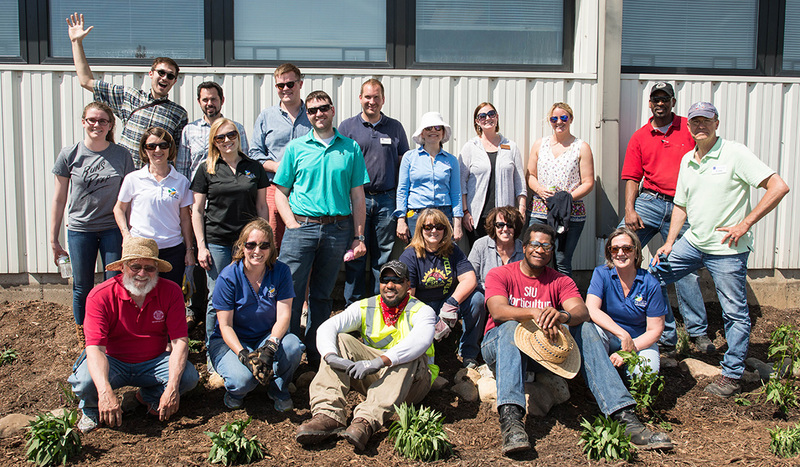 Through our combined efforts, we were not only able to construct a functional rain garden in under two hours, but also able to involve an incredible array of volunteers from a multitude of disciplines. 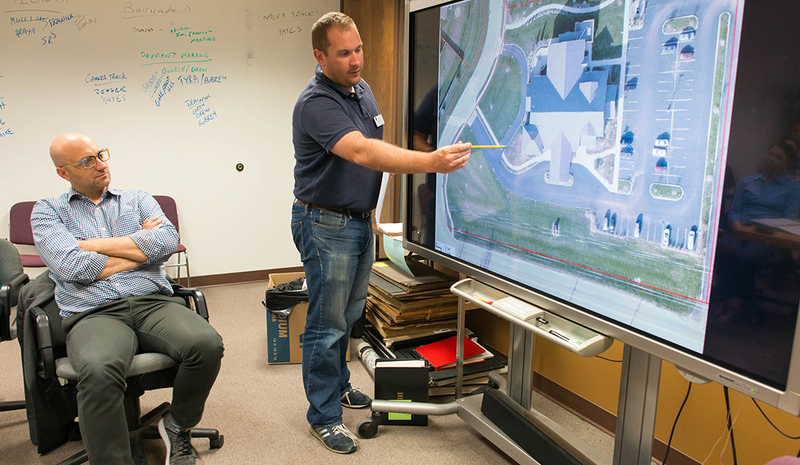 Cameron Letterly is a summer intern with the Illinois Water Resources Center (IWRC) where he is currently working on several projects in coordination with Illinois-Indiana Sea Grant.  Cameron is a student in the Master of Landscape Architecture program at the University of Illinois at Urbana-Champaign and a prospective Illinois MBA candidate.